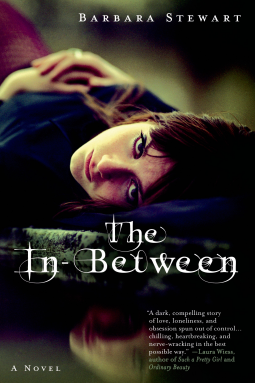 Today’s book review is for The In-Between, by Barbara Stewart, published by St. Martin’s Press. I received a free electronic copy of this book from the publisher, through NetGalley, in exchange for an honest review. Elanor Moss is a 14-year old girl moving to a new town with her parents for a fresh start after a suicide attempt. On the way she’s in a terrible car accident that nearly ends her life once more. Her near death experience opens a door to a world inhabited by bold and beautiful Madeline Torus. Madeline is everything Elanor has wanted in a best friend–and most of all, Madeline needs Elanor just as much as Elanor needs her. But Madeline isn’t like other girls and if Elanor talks about her, she could be labeled as crazy. Soon, Elanor finds her life spinning out of control. Is she having a paranormal experience, or is her damaged brain having a psychotic break? As a middle grade student, paranormal and psychological thrillers were a staple of my literary diet. Hauntings, mediums, astral projection, dissociative personalities–I couldn’t get enough of this stuff. Reading The In-Between felt like a return to those roots. It was a wonderful reminder of how gripping a well-written thriller can be. Once I got into the story, I couldn’t stop reading. Stewart does an amazing job at keeping her writing ambiguous. There is always the question of whether Madeline is a ghost or a construction of a damaged mind. This question builds amazing tension throughout the book. Even when you’ve convinced yourself that one answer is true, something will happen which throws all your assumptions into question. It’s surprising to discover, that with this amount of skill, this is Stewart’s writing debut. Probably my favorite part of the book, though, was the narrative discourse and structure. I loved that it was written as though it were Elanor’s journals. This lent itself well to a variety of chapter lengths, including one-liners or the obsessive repetition of Madeline’s name. It felt authentic as a result. It reminded me a little of my own journal-writing as a teenager–the reflection, the self-absorption, the addressing of an imagined audience. I liked how it gave such rich psychological insight to the protagonist. I’m giving this book 4 stars. It was creepy and captivating. One star is held in reserve because I wanted the “in-between” to be developed a bit more clearly. Still, that’s a pretty minor quibble. This is a great book for teens who like paranormal fiction or thrillers. It’s also excellent for anyone who has felt like an outcast, who has questioned their sanity, or is curious about what it might feel like. Since the book does discuss suicide, sleeping pill abuse, and self-harm, it is recommended for mature readers. Today’s book review is for Grave Images, by Jenny Goebel, published by Scholastic. I received an electronic advanced reading copy of this book from the publisher, through NetGalley, in exchange for an honest review. 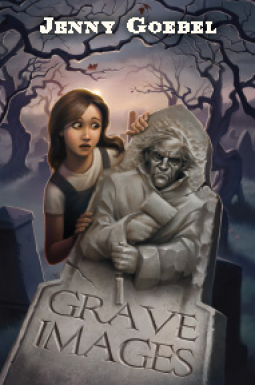 Grave Images is a middle grades thriller. Thirteen-year old loner, Bernie, is having a lousy summer. Between her family’s monument business and a clinically depressed mother who hides in her bedroom all the time, Bernie finds it difficult to make friends. However, when her father hires a new artist, Mr. Stein, to make portrait etchings for the headstones, things start to get interesting. Bernie soon discovers that Mr. Stein is etching portraits of people before they die. She becomes determined to figure out whether Mr. Stein is merely predicting the deaths or if he’s causing them. The novel is written in the first person point of view of Bernie. One of the things that I immediately liked was the stylized voice that Goebel gave to her main character. It has a sort of rural charm to it, and made it easy to imagine the character telling you the story–but it was just subtle enough that it didn’t disrupt the reading process. And through that voice, Goebel really makes Bernie come alive. Bernie is a likable character. She is flawed and hurting and lonely–but she’s also honest, determined, and caring. She has her flares of temper and frustration just like any other girl just starting puberty. So, on top of being likable, she’s also believable. I also enjoyed that even though the driving plot of the novel is supernatural and spooky, there was a lot more going on in the story. While Bernie is trying to solve the mystery of the etchings, she is also working through family struggles and the confusion of a budding friendship. She is growing into an adolescent and starting to really explore her own identity. Which isn’t to say that the driving plot isn’t enjoyable. It certainly kept me guessing for a long time. And I liked that it had just the right level of scary for the target audience. Even though there were deaths, there was no gore. There were no graphic descriptions to keep tweens up at night. In fact most of the fear element comes from Bernie getting herself worked up and spooked over her own speculation. This is a wonderful choice to put middle graders in the Halloween spirit. Or, they can read it anytime they want a good, creepy read. It’s got solid writing and age-appropriate storytelling, for which it earns 4 out of 5 stars.